IKEA has always been a modular company by trade, with an economy of fasteners and wood components they reuse when dreaming up each new piece, and wardrobes customers can add components to over time. Their NORDLI series lets you build the chest of drawers of your dreams... or nightmares. 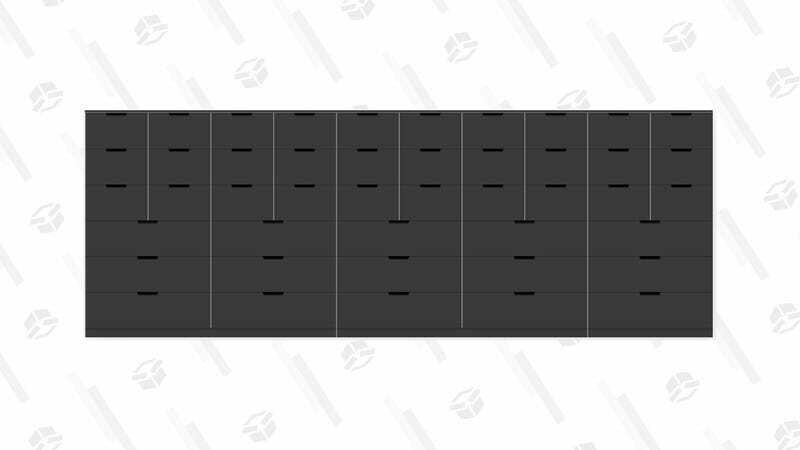 I maxed out IKEA’s NORDLI configurator for the above header image: a massive 45-drawer $1400 piece, but for my bedroom I went with a much more sensible 14-drawer affair to test the new series. There aren’t a lot of pieces in the Tetris game that is NORDLI. You can choose half or full-width drawers in stacks of two or three, and in black or white, and it would be pretty easy to paint the white fronts if you’re so inclined. The tops and bases get as wide as two big drawers. While some of the normally metal components have become plastic since my last IKEA project, and everything is absolutely filthy with “we know you’re too stupid to follow directions and secure this to the wall so here is yet another warning, please stop suing us” stickers (literally one in every drawer), other changes like clamps that lock drawers into place are welcome additions. Something else you’ll immediately notice is that IKEA’s standard “black-brown,” textured, shiny wood has been replaced with a smooth matte black I greatly prefer. That shift along with the use of cut-outs as handles allows your NORDLI to disappear even if you configured something pretty big. Whether you need a ton of storage, love subdivision, or want to bust out the paint and make a dresser your own, NORDLI is a great option.